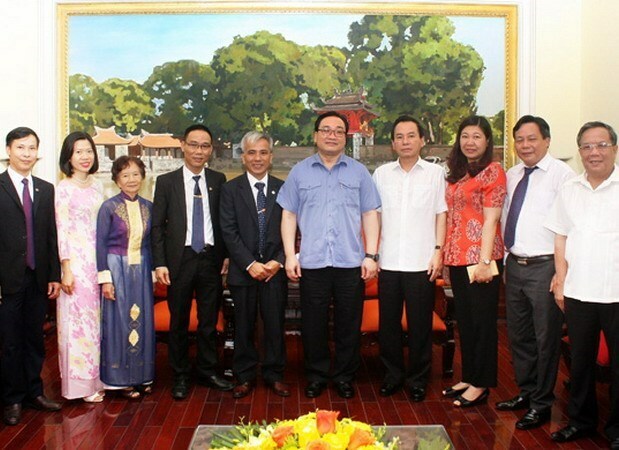 Hanoi (VNA) – Secretary of the Hanoi Party Committee Hoang Trung Hai has said he hopes the Baha’i religious community of Hanoi will continue to maintain good relations with local authorities. Hai made the statement on August 9 during a reception for a delegation from the Le Dai Hanh Spiritual Council of Baha’i Faith in Hanoi on the occasion of the 200th birth anniversary of Baha’u’llah, the founder of the religion. The Party and State respect freedom of religion of all people in an effort to build national unity, the secretary said. He lauded the religious community for conforming to laws, standing with other religions to live a good life and being active in social activities, particularly charitable events. He also urged the Baha’i dignitaries and followers to promote the country’s traditional cultural values and work with the Fatherland Front Committee and people to create a peaceful living environment and cope with social issues. Lauding the support of the city’s government in recent years, President of the Le Dai Hanh Spiritual Council of Baha’i Faith in Hanoi Pham Van Duyen reiterated that the Baha’i community wishes to join hands to develop a better society and establish harmonious relations with other communities. The Baha’i Faith was introduced in Vietnam in 1954 by an Indian female follower. The Baha’i community now has nearly 7,000 followers in 45 cities and provinces nationwide.